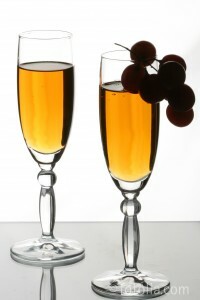 Celebrate New Year’s with some new traditions! We all enjoy celebrating the New Year in our own way. With all the traditions out there that people incorporate into their celebrations, we wonder: what are the most popular? Bisket Baskets and more have compiled a list of the most popular New Year traditions, as well as perhaps incorporating one of our holiday gift baskets, so you can practice them the way you want! Not breaking anything in your house; this includes glasses, plates, any electronics, etc. Between Christmas and New Year’s Day, you must clean the stables of your barn for fear of witches putting a spell on your livestock. Have more New Year’s traditions/superstitions? Leave us a comment below! 1. Personalized Dog & Owner Photo Frame – for the owner’s favorite pic of their pooch and themselves, decorate a frame and add both of their names on it. 2. Pet & Owner Stockings – Buy two stockings and fill one with treats and toys for Fido and the other with a cute gift for their owner! 3. Treats for Owner and Pup – Bake some homemade cookies for the owner and then make or purchase decorated cookies for their pooch! Both will be appreciative of your hard work and thoughtfulness! 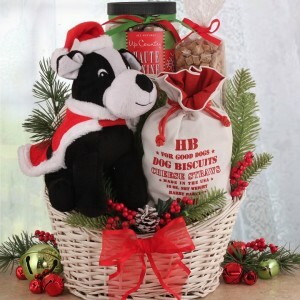 Hint: Many of our dog gift baskets feature dog-friendly “cookies” and treats. 4. Treat Mix – Give your dog-loving friend a dog treat mix for them to bake their own creations for their pup! You can find items like this in our dog gift baskets! 5. Personalized Dog Lover Mug – get a plain white mug and a sharpie. Decorate the mug with a saying or drawings then bake the mug in the oven for 30 min at 350 degrees Allow to cool completely before washing or using! Also, please tell the pet lover these are hand wash only! We hope this helps when deciding what to get for the pooch lover on your holiday gift list. 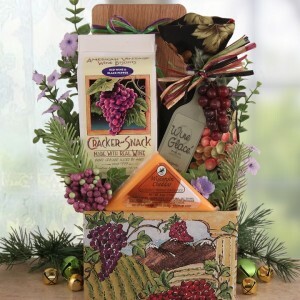 We know both dog and owner will be putting two paws (er, thumbs) up for dog gift baskets from BisketBaskets.com!